Maps play a central role in many dashboards. Not only are they often the most effective way to display your geographic information, but their operational layers can also be used by other data visualizations in the dashboard to create interesting, intuitive, and compelling information products. Map elements display web maps authored in applications such as your organization's Map Viewer. See Create web maps for dashboards for best practices. A dashboard can contain multiple map elements, or none at all. When it doesn't contain any, you can create the dashboard entirely with web layers available to you. See Understand data sources for details. Pop-ups—Displays descriptive information about a feature when clicked. For more information, see Configure pop-ups. Default Extent and Bookmarks—Provides preexisting bookmarks in your map and a way to return to the map's initial extent. Layer Visibility—Enables you to switch operational layers on or off. Basemap Switcher—Allows dashboard users to change the basemap at run time. Zoom In/Out—Allows you to zoom in or out on a map. Scalebar—Displays a scale bar near the lower left corner of the map. The supported styles are line and ruler. The display units reflect the logged-in user's profile settings. For anonymous access users, the style is always line and the units are dual (both English and metric). Search—Allows users to find locations or search features on the map. By default, search uses settings configured in the web map. 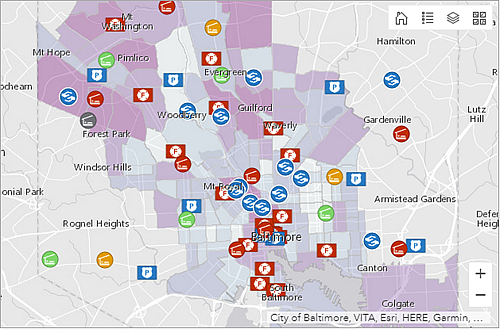 If these are not set, Operations Dashboard uses the ArcGIS World Geocoding Service. For more information, see Search locations and features. Map as the source of an action—A change in the map's extent filters the contents of one or more other dashboard elements. This can even change the extent of another map element. Map as the target of an action—A selection on a dashboard element such as a list or category selector triggers a map to pan or zoom to the selected feature. Operational layer as the source of an action—Selecting one or more features in an operational layer filters the contents of one or more other dashboard elements. This can also change the extent of another map element. Operational layer as the target of an action—A selection on an element such as a list or category selector filters the operational layer to show only what was selected.